Hey guys, I just started this topic to ask a few questions about the concept of character design sheets. Now, I've never really done them but I've always thought they could be pretty helpful in maintaining a certain look, having a quick color scheme ready and stuff like that. Do you guys agree? The one I have attached is probably the first legit, colored one I've done and it seemed like a pretty helpful experience getting to know a character that is no way the main character in my comic but one that I just wanted to solidify. How does it look? Any critique or help is greatly appreciated! Action, Fantasy, City Life, Mystery, Humor, Romance all in one comic! Who could ask for more! I'd say you're doing fine with what a character sheet is meant for; you've got the same character from multiple angles, both full-body and a close-up of the head, and the colors work together well. 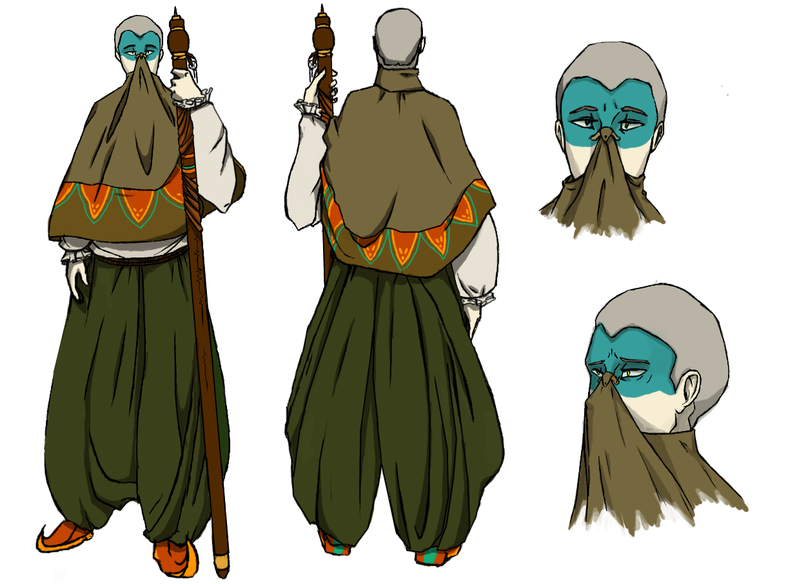 One thing I'm wondering though, the guy looks like someone living in the desert, and I'm guessing the cloth over his mouth and nose is to keep out harsh winds and the such, but his eyes are left completely unprotected. Unless I'm completely wrong about what that's for, in which case never mind that last part, point is the character sheet itself seems sufficient. I've designed characters in advance but I've never done anything like a character lineup. I don't think I could be bothered to worry about whether a character is one or two inches shorter than another character. Most of the time I can't even remember all their costume pieces. Thanks for the comments everyone. As for the design portion, this character is actually a demon. He keeps his mouth covered because it's abnormal and he doesn't want it to be noticed. But I agree the design does look desert-like, so some eye covering might make sense. As of a character lineup, I think that that is actually a great tool for me to get an idea of not only the character's heights (as mentioned, it's hard to keep track of that) but to get a better idea of their body structures. I might post a lineup soon, so thanks for the help! Here is...not exactly a character sheet but a character study...I tried going through a range of emotions for my character, Merc Jenkins, and while his design has changed quite a bit since the time I drew this, I thought it was still worth sharing! Let me know what you think! I think that's a pretty solid reference you have. Line-ups are are also very useful, since not only do they help you keep track of height differences, but they also let you see everyone together so you can make sure your character designs contrast with each other enough. Ideally, you'll be able to squint and still recognize characters by their overall shapes/silhouettes. 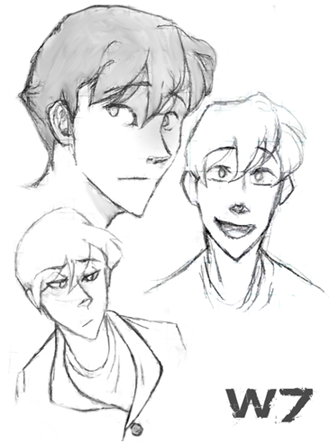 Your expressions are looking good too- I can tell what the emotions are supposed to be, and the face structure is pretty consistent between all of them. I'd suggest practicing expressions with a half/full body pose too, since body language can change a lot from character to character. The two smiling sketches look a little off in the mouth area, so you might want to practice a bit with some photo reference. 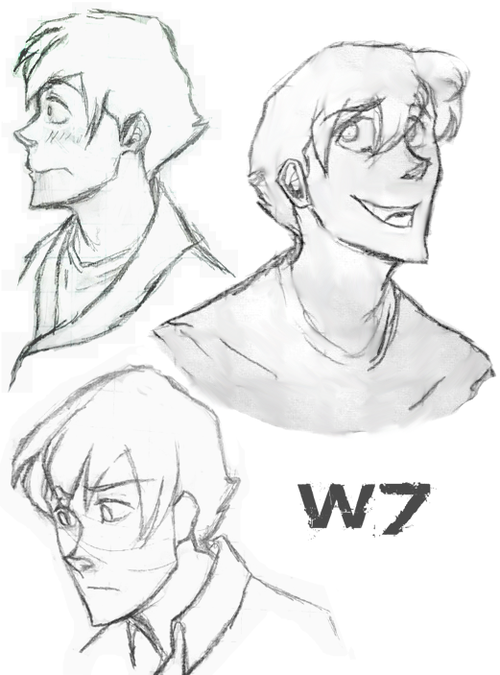 You should be able to find some good references easily on Pinterest or deviantart. Warning: Contains some flashy gifs and body horror. This is good. I should start doing that! I do the lineups so I can compare heights/faces/general shapes most of the time, but I should really try drawing the same character over and over to make sure it still looks like them, which you have done here really effectively. And I know the person above me thinks that Merc's smiles don't look natural or anatomically correct, but I disagree. I think they look just as natural and fluid as the other expressions, and I think you've done this very well. They don't look forced or incorrect to me at all. And it always looks like the same guy each time. That's just my opinion. But I like your original character sheet a lot. I have seen that some people also write down their height and weight next to the drawing, which probably helps them keep track, instead of drawing a lineup. I say it looks fine, looks like a character that could have some rich development, maybe a couple of quirks.